Just over two months ago we had published the preliminary specs and expected performance out of NVIDIA’s GTX 1170 based on all the contemporary rumors and leaks at the time and we labeled it a potential GTX 1080 Ti killer. If this recent leak is to be believed then we’re indeed looking at a GTX 1080 Ti killer. The GTX 1170 allegedly features a 256-bit memory interface paired with 16GB of GDDR6 memory and will run at a whopping ~2.5 GHz clock speed which is outrageously higher anything we’ve seen on Pascal and Volta, making it the highest clocked graphics card we’ve ever seen to date, if this alleged leak is to be believed. 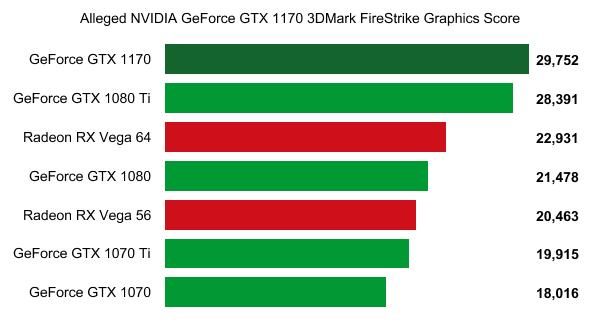 The card allegedly scored 29752 graphics points in 3DMark FireStrike, putting it ahead of NVIDIA’s GTX 1080 Ti and significantly ahead of AMD’s RX Vega 64. Based on these figures, we’re looking at a card that’s no less than 65% faster than the GTX 1070, and no less than 38% faster than the GTX 1080. There are several red flags associated with this “alleged” leak, and I say alleged because we’re not entirely confident in this “leak” to classify it as one, at this point in time it’s more so a rumor hence the rumor tag in this article. The fact that what we’re looking at is a photograph of a screen rather than an actual screenshot or even better a 3DMark database entry makes this “alleged” leak suspect because it can be faked. All the “leaker” would need to do is take a screenshot of an ordinary 3DMark score, edit it with the GTX 1170 details that they want, display the edited image on the screen and then take a photo. In fact, we’ve seen this exact method used in abundance to create fake leaks before. 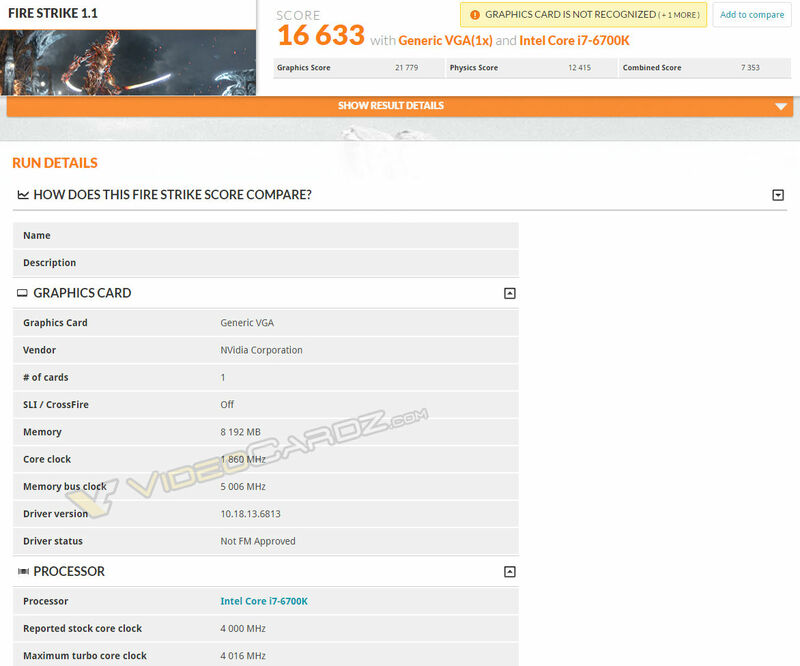 The second red flag is the fact that we were not able to locate this 3DMark entry in 3DMark’s online database, although a careful tester could conceivably block 3DMark from creating an online entry this “alleged” leak photo shows a database entry rather than an offline 3DMark benchmark run. An entry that does not exist online as far as we can discern. The third red flag is the fact that the entry displays the card as a GTX 1170, rather than an NVIDIA “generic VGA” entry as is usual with early graphics card leaks. It’s unlikely that 3DMark would be able to correctly identify a GTX 1170 card as a GTX 1170 ahead of the card’s launch and is much more likely to simply report it as a “generic VGA” NVIDIA card. The fourth and final red flag is the clock speed. A ~2.5 GHz clock speed out of these chips is very unlikely, largely because we’re most likely still talking about 12nm silicon and even a 2 GHz clock speed out of the box would be optimistic. At the end of the day we simply were not able to verify the authenticity of this leak and even though the level of performance it reflects could very well be accurate we would urge readers to take it with the usual grain of salt associated with unverified rumors, which this very much classifies as. With all of that being said, we expect big things from NVIDIA’s upcoming Turing GPUs and would not be surprised if the upcoming GTX 1170, or whatever NVIDIA might end up actually calling it, can deliver GTX 1080 Ti class performance or close to it. We’ll know for sure soon enough, as soon as next month at Gamescom in fact, so stay tuned.